The nautical theme is everywhere this summer! We can make cake balls and cake pops that are the perfect compliment to your nautical themed baby shower or birthday party. Adorable whale, anchor, and wheel sugar toppers adorn our delicious cake balls and cake pops and you can even customize your background colors to perfectly match your decor. 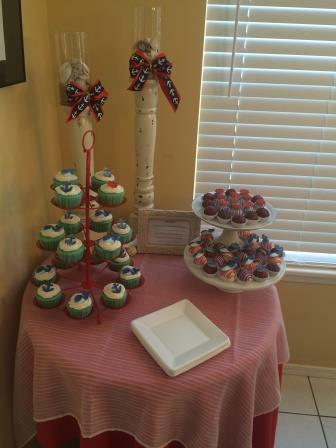 We love how this mom-to-be incorporated our cake balls into a dessert display! Want to create custom cake balls or cake pops for your event? Email us at info@cakebites.biz to discuss options!